We’re very excited to announce the addition of the Dataset Library to BioGPS! 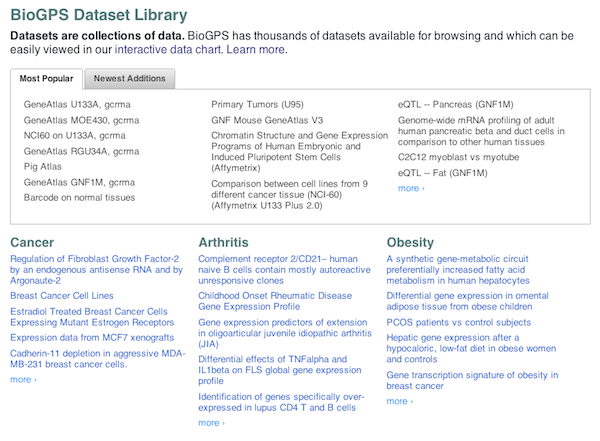 As I mentioned in my last blog post BioGPS now has thousands of datasets available for browsing. Providing this many datasets comes with some challenges, including making them easy to search and navigate for our BioGPS users. Version 2.0 of the data chart plugin was the first step towards these goals, and the Dataset Library is one giant leap in the same direction. Just like the Plugin Library the Dataset Library supports multiple ways for you to find the data you’re most interested in. The “Most Popular” and “Newest Additions” tabs help you get a quick look at datasets that the community frequently uses as well as those that have just been added to BioGPS. The Dataset Library also has categories of datasets (“Cancer”, “Arthritis”, etc) that allow you to quickly find relevant datasets. The Dataset Library also supports searching across datasets by tags and species, just as the Plugin Library does. If you have a specific term, sample, etc that you’re looking for in datasets this can be done in the Search bar. Simply prefix your search with “in:dataset” and add your keywords. For example to search for all datasets that were profiled in the A549 lung cancer cell line, your search would be “in:dataset A549“. Hit the Search button and all datasets that contain “A549” in any of their metadata fields will be returned in your results! Previously BioGPS datasets were only identified with an internal integer (dataset “100”, etc). We knew we could do better (and make our URLs easier to read) by adding GEO identifiers as another way to look up datasets. Now if you want to see a specific dataset using its GEO ID (eg. “GSE1133”) it is as simple as going to http://biogps.org/dataset/GSE1133. Keep in mind that we’ve only loaded a subset of GSE datasets to date (mostly human). If there are public datasets that you’d like to see loaded, let us know! love your site and the crowd – sourcing approach.